DNA Testing companies like Ancestry DNA, 23andMe, MyHeritage, Helix, and FamilyTreeDNA might be using your private information in ways that you don’t understand, and that puts your privacy at risk. If you haven’t used a DNA testing kit yourself, you probably know somebody who has. Companies like AncestryDNA, 23andMe, and MyHeritage promise to help you uncover the secrets hiding in your saliva. Most who sign up simply want to learn about their regional and ethnic origins, but some DNA testing kits are now uncovering genetic health risks, personal traits, and carrier statuses. These services have even found their way into current events: 23andMe offered to help reunite families separated at the border, and the formerly ‘cold cases’ of the Golden State Killer and the murder of April Tinsley were solved using the services of similar DNA testing companies. The market for these services is thriving. In 2017, the industry was worth about $99 million, and is expected to be worth $310 million by 2022. AncestryDNA, the largest DNA testing company, has performed millions of tests in the last 7 years, amassing hundreds of gallons of saliva. 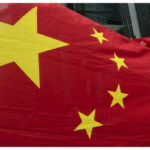 Issues have been raised regarding the accuracy of these tests and, of course, the issue of privacy. Is it safe to hand over your most sensitive personal information to these private companies? Ancestry will keep your saliva sample indefinitely, but they will dispose it if you make a request over the phone with their customer service team. We appreciate that Ancestry provides a Live Chat support option, so it’s easy to get answers to privacy questions. However, the strangely secretive nature of their collaboration with Calico labs could raise concerns for many users. What is most concerning to us is their historical record and people search service, which makes it easy to find anyone’s personal information. For these reasons, they receive a privacy score of 2 out of 5. Read more about Ancestry DNA and privacy here. 23andMe is the second most popular DNA testing kit, claiming over 1 million customers. Their pricing ranges from $99 to $199 depending on which services you choose. Like Ancestry, they have a detailed Privacy Center, but they do not offer a chat service. When I emailed in privacy questions, it took them a little over 24 hours to respond, but their response was thorough. 23andMe does give you the option to have your saliva disposed after testing; they will otherwise keep it for up to 10 years. Finally, their focus on the health data market and their partnership with GlaxoSmithKline has raised serious concerns about the monetization of consumer data, so they also receive a privacy score of 2 out of 5. How are DNA Testing Companies Using Your DNA? Your DNA is your most sensitive information, even more personal than your social security number or your fingerprint. It’s frightening to think that these private companies are storing that away, and could one day profit from it in ways you never actively agreed to. Many customers don’t think about what happens to their DNA sample after they receive the results of their tests. 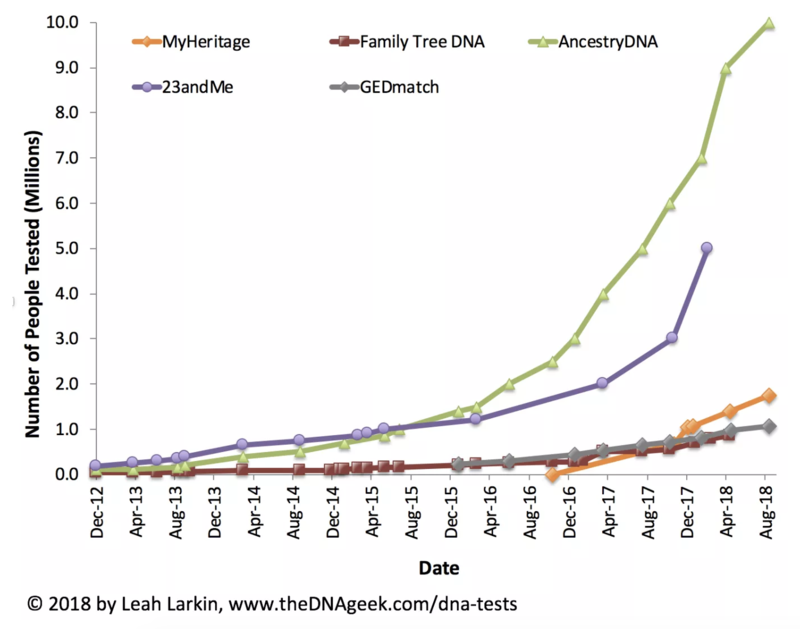 Both Ancestry and 23andMe use the data they have acquired for research projects. 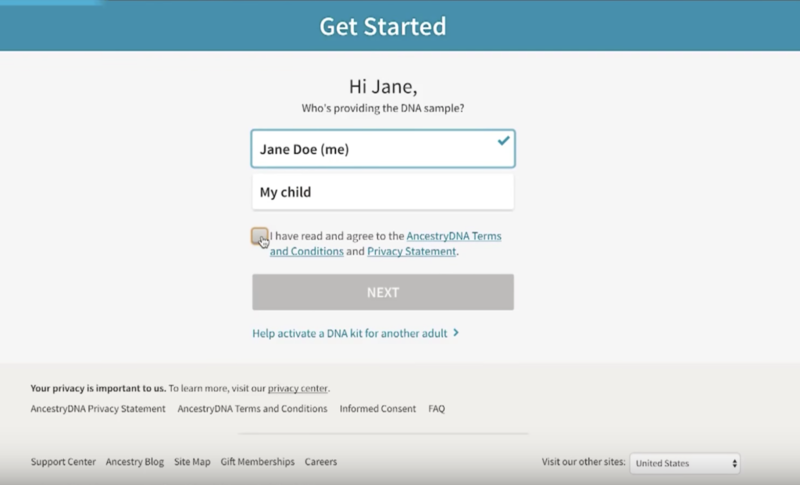 Most AncestryDNA customers consent to have their de-identified DNA results shared with research partners to improve health sciences, such as curing diseases. Similarly, 23andMe says that it will not share your information with third parties unless you opt in, which about 80% of users do. The research goals of these companies, however, are not made clear. While customers might believe they are participating in altruistic research, they will not know exactly what kind of research their data is involved in. Ancestry’s main research partner is Calico Life Sciences, a Google subsidiary whose focus is on extending human lifespans. Calico does not reveal much about their research, and has been criticized and called the “vanity project” of a few Silicon Valley billionaires. 23andMe partnered with drug giant GlaxoSmithKline to develop drugs for treating Parkinson’s disease. President of the Center for Medicine in the Public Interest, Peter Pitts, has raised concerns over people paying to give their DNA to for-profit companies. Your DNA Could be Used Without Your Knowledge- Are You “Giving Away” Your DNA? New York Senator Chuck Schumer, who has called for a Federal Trade Commission investigation of DNA test companies, criticized the Terms of Service agreements used to get this consent from consumers. A press release on his website argues that the language used, “clearly suggests a desire for firms to monetize the DNA data they receive. At the same time, it is so vague that consumers do not have any concrete understanding of to whom and for what purposes their data might be sold or used.” In the past, the FTC has warned consumers of the privacy risks in using a DNA testing service, and is now investigating DNA testing companies over the way they handle private information and genetic data. It’s unclear whether these DNA testing companies might one day share individuals’ DNA data with employers or insurance companies. Your DNA reveals things like your skin color and propensity for inherited diseases. While the Genetic Information Nondiscrimination Act protects Americans from this kind of sharing, there are gaps in the law that allow insurance providers and the military to make decisions based on DNA results. For example, while health insurance companies cannot access the direct test results that you receive from the DNA test kit, they can ask you about your knowledge of any genetic predispositions–and take those into account when setting your rate. If you don’t tell them about this ‘knowledge’, they can decline or rescind your insurance application if they find out about it in the future. These sites claim that the DNA data and sample they hold is completely safe. They claim to depersonalize the DNA that they acquire, which only they can re-personalize to send consumers their results. Yet, researchers were able to find out the last names of several men using short repeats on the Y chromosome and a DNA service. 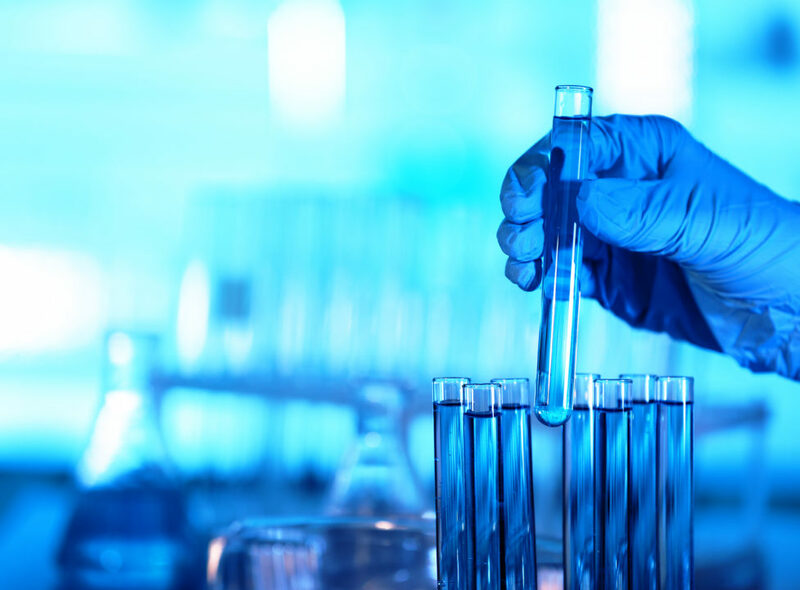 Once genetic information is shared with partner companies, each company is no longer responsible for the security protocols of the other parties. While some of the practices of these DNA testing companies are unclear, it is clear that they do not prioritize user privacy. Using DNA testing kits presents many worrisome implications for your personal information. If you still want to use a DNA testing service (or already have), we have some recommendations for maintaining your privacy. 1. Do not share your information with other users. 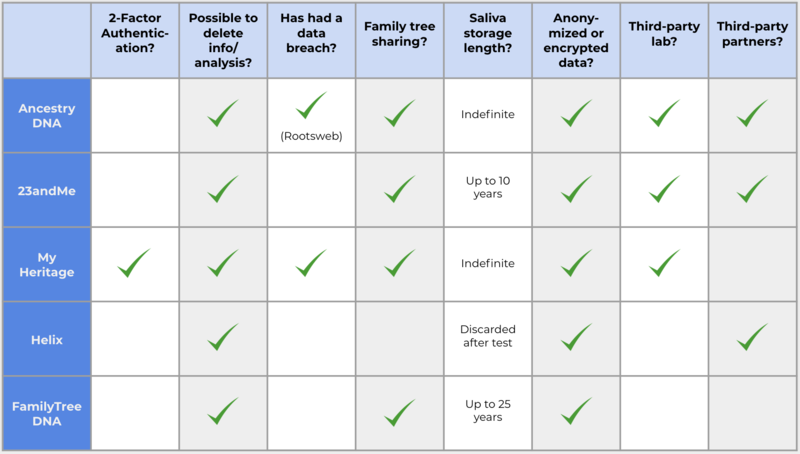 For sites that offer family tree services, keep your tree private. Be cautious of these kinds of services. Many of these companies have services to match you with people to whom you may be related, but these people may still be strangers who you do not know, and so you should be careful. 2. Go over privacy policies and terms and conditions carefully and skeptically, and be aware of the information that is shared with third parties. If any partners have access to your data, you should read their Privacy Policies as well. Go over your privacy settings in your account. The default settings are usually best for the company, not necessarily for your privacy. Finally, when signing up, be careful about what kinds of services to which you are consenting: Who is doing the testing? 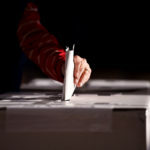 What will opting-in mean for your privacy? How will this affect who has access to your data? 3. You can have your personal information erased, and even have your saliva sample destroyed after receiving your results. Download your information if you think you will want to save it for later. Call the customer service department of the company and request that your saliva sample is destroyed. Make sure that they aren’t just storing it away to be monetized later. We’ll have more on this in future posts. 4. Use Abine to protect your accounts on these sites, and all of your other online accounts. Blur can help protect you from breaches and hacks by giving you a masked email and unique password for each site. Blur’s Masked Cards can help you purchase kits securely and anonymously, so that your credit card information stays safe.